Free deals can turn even the most rational consumer into a crazed lunatic. But are they as good as they seem to be? In commerce, a single phrase wields the power of a thousand salespeople. It can turn even the most rational consumers into crazed lunatics who stand in 3-hour-long lines to save $3 and punch each other in the face over pieces of cheesecake. Deep down, most of us understand that nothing is truly free. Corporations don’t offer us deals out the goodness of their hearts — they do it because it’s great for business. Sometimes, these promotions can even be flat out deceptive. So why does the allure of ‘free’ hold us captive? And are these deals even worth it? Let’s imagine you’re hankering for a treat and you are offered a choice: A Hershey’s Kiss for $0.01, or a much higher-quality Lindt truffle for $0.15. Which would you go with? In his book Predictably Irrational, behavioral economist Dan Ariely ran this exact experiment and found that 73% of folks chose the pricier Lindt. But when he changed the price of the Hershey’s Kiss from $0.01 to free, 69% opted for the Kiss. The introduction of that one word — free — entirely reversed the outcome of the study. When confronted with a purchasing choice, we typically run a quick internal cost-benefit analysis, weighing potential satisfaction/joy against price. But Ariely concluded that when the word ‘free’ is introduced, it not only decreases the cost but makes us believe the benefits of the free item are higher. Suddenly, that mediocre Hershey’s Kiss is the finest chocolate known to mankind. As a result, we fall victim to the zero price effect, a phenomenon whereby our demand for an item dramatically increases when it is free. For example, most of us would never purchase a low-quality, ill-fitting t-shirt at a store for $15. But when that same t-shirt is free, launched from a cannon at the ballpark, we’re willing to break bones and spill $12 beers to get our grubby hands on it. Retailers are well aware of this — and for more than a century, they’ve taken advantage of our lunacy by enlisting a promotion known as the BOGO. We’ve all seen it flashing across TV screens, splayed across e-commerce landing pages, and pinned to sweaters at clothing stores: BUY ONE, GET ONE FREE! While the origins of this infamous promotion are unclear, The Hustle traced it back to newspaper clippings from as far back as 1908. 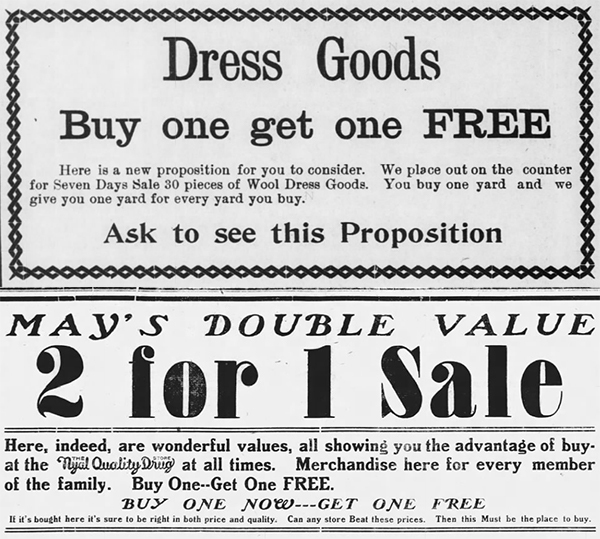 Largely marketed toward women, these early ads offered 2-for-1 wool dresses. In these early days of price opacity, the first dress would be marked up to cover the cost of both. Today, these offers, affectionately called ‘BOGO’ by the corporations that peddle them, make up an estimated 80% of all ‘free’ promotions. A whopping 93% of all shoppers have used a BOGO — and 66% of them say it’s their favorite type of discount. For retailers, BOGO deals are extremely effective: They allow for the profitable liquidation of low-quality inventory under the guise of “doing something nice” for loyal consumers. Let’s say a retailer has a surplus of jeans that cost them $20 per pair and carry a “suggested retail price” of $100 (they never actually sell at this price). If they run a standard 50%-off sale, they make a $30 profit ($50 – $20). With a BOGO, they offload two products instead of one and walk away with the same profit per pair. “The BOGO is one of these quasi-legitimate — maybe not-so-legitimate — deals that rely on consumers not paying a lot of attention to what they’re doing,” Mark Cohen, Director of Retail Studies at Columbia University’s School of Business, tells me. The math is simple: What you’re really getting with a BOGO deal is a 50% discount off of the manufacturer’s suggested retail price (MSRP). And oftentimes, this price is artificially marked up to begin with. Bonnie Patton is the Executive Director of Truth In Advertising, a nonprofit that aims to regulate deceptive advertising and false marketing. On a daily basis, she receives a “barrage of alerts” from the public on shady ‘buy one, get one free’ promotions. A common tactic with shady BOGO deals is that the retailer will simply make the first item more expensive. You might, for instance, see a deal where you buy one shirt for $40 and get one free — but it’s possible that the true price of the shirt is $20, and you’re merely buying 2 at list price. Burger King offered a BOGO Croissan’wich deal but charged a higher price ($3.15) for the sandwich than it regularly cost ($2.16). 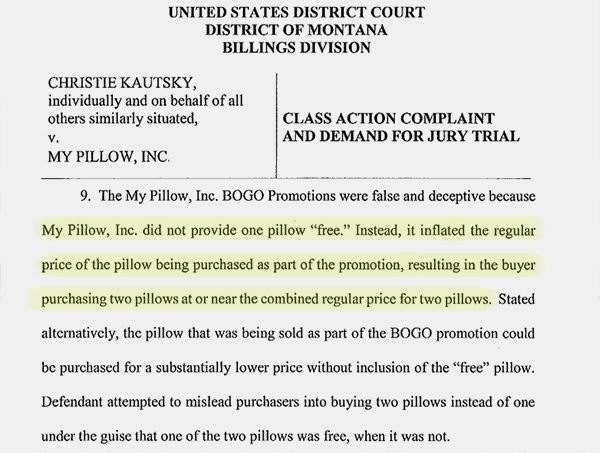 MyPillow offered BOGO deal on their pillows, but really just doubled the price of the first pillow. VIsionWorks offered a BOGO on eyeglasses, but it turned out they’d increased the price of the first pair by ~40%. Jos. A. Bank offered BOGO deals on clothing but inflated the cost of the original item (i.e. a suit that would typically sell for $600 was sold, as a part of the “deal,” for $800). Another misconception with buy one, get one free deals is that your total utility (satisfaction or happiness) is higher since you paid less for two items than you would’ve at list price. This makes sense if the item is something you know you’ll eventually use (like toothpaste), but BOGO deals are more typically applied to goods like expirable food, or clothing. But we often forget about a little something called the law of diminishing marginal utility. Simply put, this law states that the utility we get from an item decreases with each subsequent item. If we get a 2-for-1 pizza deal, for instance, the first slice is going to give us tremendous joy. The second slice, a little less. 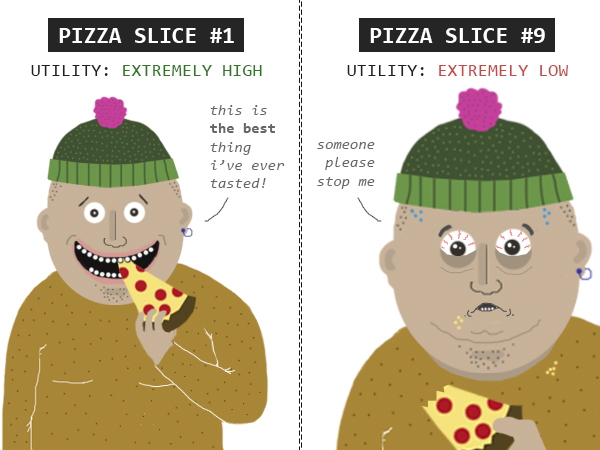 By the time we get to the second pizza, we’re bloated and the benefits of eating it have dramatically declined. Studies have shown that consumers will buy two of something when the word ‘free’ is involved, even when they only need one — and the second item often ends up in the trash. If we walk into a store intending to buy one carton of milk, but encounter a BOGO deal and buy 2 cartons, we’ll almost invariably waste that second carton. So unless you encounter a BOGO deal on something you already planned on buying 2 of (and have an actionable use for), it’s generally not worth it. Of course, the BOGO deal isn’t the only ‘free’ promotion retailers use to amp up our consumption. Most online clothing brands offer ‘free’ shipping, with the catch that you have to meet a minimum purchase amount (often $100) to qualify. Some 58% of consumers will add additional items to their cart — often things they didn’t originally intend to purchase — just to “save” $5 to $10 on handling fees. On platforms like Amazon, free shipping is often factored into the price of the item: A coffee mug that usually sells for $10 + $3 S&H will go for $13, with FREE shipping. We’re far more likely to buy the mug with the latter pricing model, even though we’re paying the exact same amount for it. Another common tactic is giving an item (say, a book) away for free, but burying the original cost in the shipping fees. If the book typically costs $15, the seller might throw out a “GENEROUS ONE-TIME FREE OFFER!” and advertise the book at no cost (besides, of course, the $15-20 shipping in the fine print). Aided by the psychological hypnotism of ‘free,’ these strategies result in increased sales at no additional burden to retailers.